So glad you had a good Halloween weekend and enjoyed the snow. The video is sick. Can't wait to watch Fabric of the Cosmos tomorrow night. I caught a snippet on NPR Science Friday (yea, you read that right) about the show, sounds fascinating and... complex to say the least. Jeff and I had a great Halloween weekend too. We didn't get as much snow as you, but what we did get was pretty beautiful. Jeff had to do some work from home on Saturday, so I snuggled in and watched a few episodes online of Revenge which Lacy suggested. I'm totally hooked and totally recommend. And if you've missed them, you can watch all of the episodes online. On Saturday night, Jeff and I went to a Halloween party at the house where Nick used to live many moons ago. Yes, the bachelor pad lives, and still throws great parties. I stopped by one of those temporary Halloween stores last week and picked up some costumes for us. 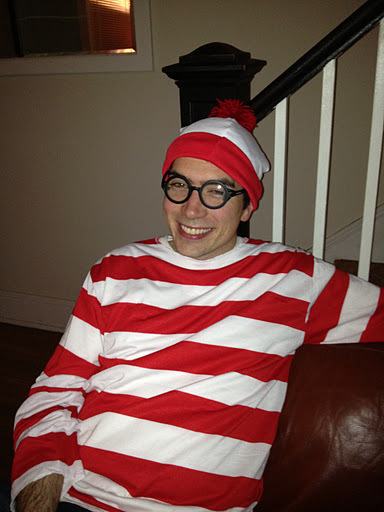 I don't love couples costumes unless they're super clever, but this year I was too lazy to think of something good, so I called Jeff at work to make sure Waldo had a girlfriend and called it a day. Here's Jeff as Where's Waldo. Creepy right? Who knew I married the spitting image of Waldo. I don't have any good pics of me, but I was in the exact same costume dressed as Wilma/Wenda. Turns out Jeff also looks like the Yellow Wiggle, someone literally stopped him on the street to tell him that once. And let's not forget this epic Snow White costume of 2006. I promise he's not really smoking, just pretending. Although let's face it, in real life, Snow White probably could have used a cigarette. A man of many faces. PS... Not only did I get my new iPhone in the mail yesterday, the new Flavia book comes out today! JOY! I pre-ordered it (obvi) so it should be in my mailbox this afternoon!